On the day Pearl Harbor was bombed, Monroe Hackney and Audie Murphy were on a double date in Greenville, Texas. Little did they know as they were laughing with some local girls, a disaster was happening which would change the course of their boyhood forever. An unannounced military strike conducted by the Japanese navy against the United States naval base at Pearl Harbor, Hawaii on the morning of December 7, 1941, resulted in the United States’ entry into World War II. The attack was intended as a preventive action in order to keep the U.S. Pacific Fleet from influencing the war that the Empire of Japan was planning in Southeast Asia against Britain and the Netherlands, as well as the U.S. in the Philippines. The assault sank four U.S. Navy battleships and damaged four more. The Japanese destroyed 188 aircraft, and killed 2,402 U.S. military personnel, including Celeste, Texas’ own young and bright, James Horner. The attack also wounded 1,282 more, as reported by the Honolulu Star Bulletin. Monroe Hackney told Harold B. Simpson, when they found out that afternoon Pearl Harbor had been bombed, Audie told Monroe he wanted to “join up right away,” even though he was too young and looked even younger. He told another friend, Bob Sullivan, he wanted to join the Marines as soon as possible and “be trained as a sniper.” I am sure his hometown mourning a fallen son added to his passion to right the wrong. Murphy had feared the war might be over before he turned the legitimate soldiering age of eighteen, and so he mapped out his campaign. He was delighted to learn that his birth certificate was unavailable, having burned to a crisp some years before along with the Hunt County Courthouse. This opened the way for fake documents, and Audie happily secured the proper forms and went to call on the old doctor who had delivered him seventeen years ago. “Would you fill this out for me?” Audie wanted to know. “When the Japanese hit Pearl Harbor, I was half-wild with frustration. Here was a war itself, and I was too young to enlist. I was sure that it would all be over in a few months, and I would be robbed of the great adventure that had haunted my imagination. “Leaving the office in a blaze of unreasonable anger, I tried the Paratroops. This was a new branch of service, lacking the legendary color of the marines, but it sounded rough. There was another point in its favor; paratroopers wore such handsome boots. Audie was one of the 18 million men who would be processed by the armed forces from 1941 to 1945. So, after procuring the altered papers, Audie tried again at the Army Recruitment Office in the basement of the Greenville, Texas Post Office. So, early on June 30, 1942, Audie hitchhiked into Greenville from his sister Corinne’s home in Farmersville, Texas. 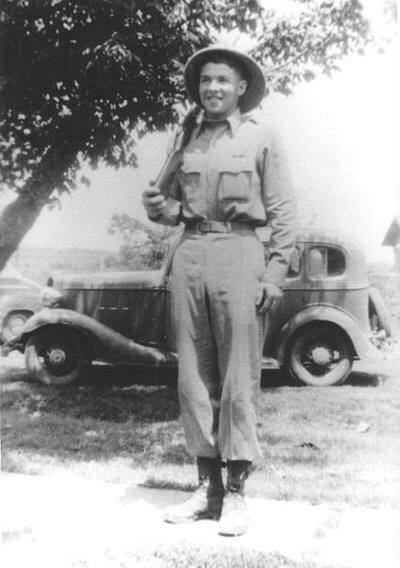 He may not have gone to the devil where he had often requested the officers to go, but he sure enough wound up in hell . . . .
To be continued . . .This is the seventh in a series on Audie Leon Murphy, born in Kingston, Texas, reared in Celeste, who grew up to become the most decorated soldier of World War II.